For all our T6 campervans with a tailgate (Cromarty, Tiree, Sanna and Taransay) it is possible to carry up to four bikes on a fold down rack on the rear of the vehicle. To use the rack you simply fold the rack down, clip on the bikes and you’re ready to go. 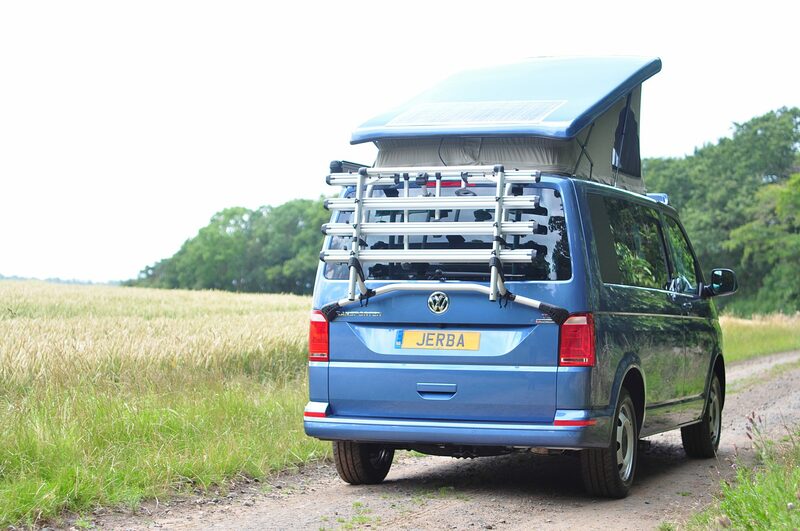 For the Jura, which always has double rear barn style doors, then due to the potential strain on the door hinges the rack can only carry 2 bikes. When we fit a cycle rack to a tailgate we always have extra gas put into the VW gas struts that open and hold up the tailgate – this prevents the tailgate from closing unexpectedly because of the extra weight of the bike rack. 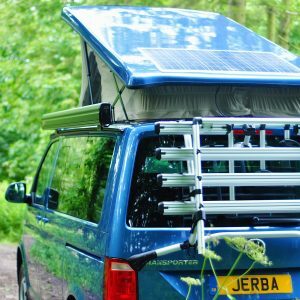 With a tailgate design the rack is not permanently fixed to the van, it is clamped firmly into place but people generally simply leave the rack and never remove it. Please note that the total weight of all the bikes combined cannot exceed 60kg. With the Jura however permanent fixings through the body work are required, so removing the rack is not possible. As standard we fit the Volkswagen own brand cycle rack as we feel that it is simply the best on the market – it is only available with rails to carry 4 bikes, an option for 2 or 3 isn’t possible. Fiamma do now produce a competing product which starts with fittings for 2 bikes and has the option of increasing to either 3 or 4. 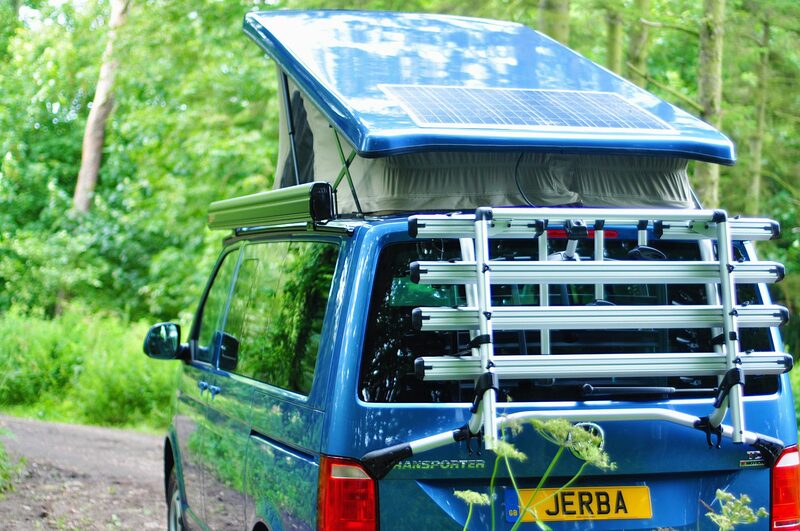 Fiamma’s rack is slighly cheaper, but having fitted and used both we definitely feel that the Volkswagen rack is sturdier and a better overall product. 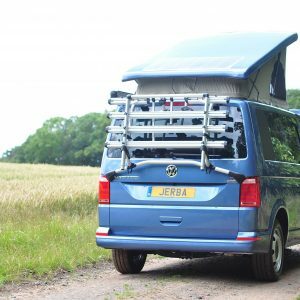 For the Jura conversion the VW rack is not suitable but Fiamma do make a model that will fit the T6 double rear doors.